A whole new breed of Observatory Domes. 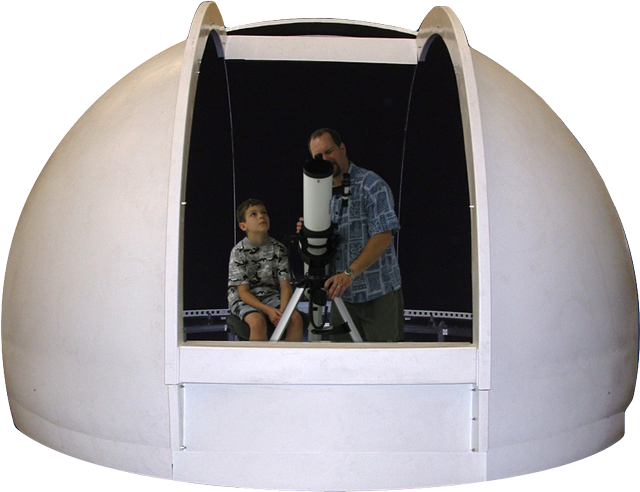 We offer the original 8’ Explora-Dome I and now the 11’6” Explora-Dome II. Now you can afford to sit inside a true Observatory, sheltered from the winds and annoying neighbor’s porch lights. No more need to haul your equipment out, set it up, and then when you’re finished, break it down and haul it back inside. 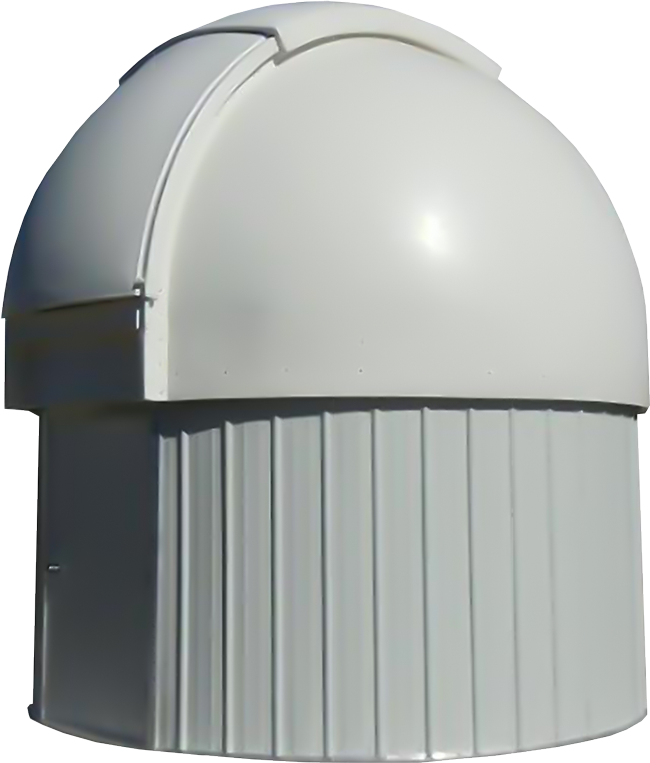 The 8’ Explora-Dome I is rotationally molded as a one piece unit. It is manufactured of very strong, UV stabilized polyethylene plastic making it extremely durable and impact resistance and slippery enough that under normal conditions snow slides right off the Dome. The 8’Explora-Dome I features a two door shutter system: the lower shutter door flips outwards, while the upper door glides open and closed. has been designed to allow the owner to add different option packages of their own choosing or design a building that suits their needs. The difficult task of creating the Observatory Dome has been done for you. All the Explora-Dome I surfaces and doors have an average thickness of ¼” and yet it weighs in at an average of 180 pounds. Best of all, you aren’t sacrificing quality for price. Fiberglass takes hours of laying up the resins and glass. That is why they cost so much. The 8’ Explora-Dome I and the 11’ 6” ExploraDome II are molded and easily duplicated, thus reducing the cost to an affordable level. The Explora-Dome I is 96” in diameter and 54-inches tall including the skirt; 48-inches from the top of the skirt to the top of the dome. The aperture opening is about 26-inches wide, and opens about 10” past zenith. allows the individual astronomer to choose the features they want, this allows you to be as budget conscious or as extravagant as you desire. Accessories such as Roof Transition Panels allow mounting the 8’ Explora-Dome on a 10 X 10 building without worrying about how to cover the roof area, a single Extension Bay or multiple Extension Bays can be added to the 8’ Round Building to add additional storage space for you equipment. Optional rotation systems or full automation systems can be added to the Observatory Dome to meet all your personal needs. Because of the demand for a more precision rotation system for the Dome we have now gone to a fabricated aluminum mounting ring and a fabricated aluminum wheel ring and higher quality rotation wheels, so we now have a much smoother and more precise rotating Dome than in the past, on the average the Explora-Dome I can be moved with just 2 fingers and the Explora II with just 1 hand. Polyethylene is 100% recyclable so it is environmentally friendly.